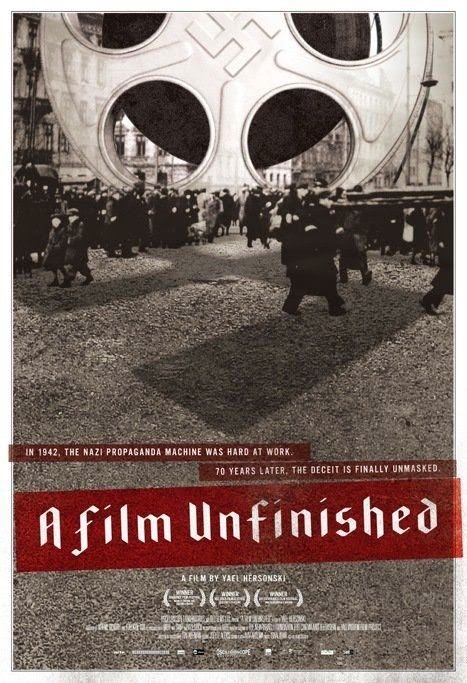 Tag line: "In 1942 The Nazi Propaganda Machine Was Hard at Work. 70 Years Later, The Deceit is Finally Unmasked"
From the moment they ascended to power in the early ‘30s, the Nazi’s propaganda machine was spinning in full force, turning out information designed to generate support for their new policies. Along with their efforts in both print and radio, the Nazis produced hundreds of motion pictures, the most notable of which is Leni Riefenstahl’s Triumph of the Will, a film that chronicled the 1934 Nazi Party Congress in Nuremberg. Among the many movies they made was one that was never finished: The Ghetto, a documentary-style picture shot within the Warsaw Ghetto in 1942. Designed to show how callous the Ghetto’s “wealthy” Jews were towards their poverty-stricken brethren (accomplished with scenes that were clearly staged), The Ghetto also captured a number of heartbreaking images, including hundreds of starving men, women, and children wandering the streets in search of something to eat. In 2010’s A Film Unfinished, director Yael Hersonski investigates the making of The Ghetto, while at the same time showing us the horrors endured by its main subjects, most of whom would be dead before the war was over. Aided by diary entries and eyewitness testimony, A Film Unfinished attempts to solve the mystery surrounding The Ghetto, from the unknown cameramen who shot the movie to the reasons why it was never completed. Yet as fascinating as this investigation is, it’s the images lifted from The Ghetto that will hit you the hardest. There’s footage of a woman carrying her baby up and down the street, calling out to anyone who would listen to her (one of the survivors of the Warsaw Ghetto, who was invited to view the film, says she remembers that woman, and that all she wanted was a piece of bread for her child), and glimpses of starving children so emaciated they can’t even sit up in bed. Most disturbing of all, though, are the dead bodies that lined the sidewalks, placed there by relatives who no longer had the room to house them. In a particularly moving scene, one of the ghetto survivors averts her eyes when footage of a mass grave is shown. Yet, despite how distressing she finds this sequence, she says she’s happy it now affects her so. While in the Warsaw Ghetto, she grew accustomed to seeing death. The fact that she can no longer bear to watch such things proves her humanity has returned. What was once commonplace has suddenly become grotesque. As gripping as it is unsettling, A Film Unfinished is every bit as effective a documentary as The Last Days, recounting a time in history that we don’t dare forget.